I Hate My Hair — Can Hoshall’s Fix It? I hate my hair. We’ve all been there, right? Sixteen months ago, my mid-length locks had been unintentionally chopped into the infamous “I’d like to speak with the manager” cut. Too traumatized to attempt a fix, I’d settled for hiding it under hats and bobby pins. Needless to say, it wasn’t a great long-term plan. So, when the folks at Hoshall’s Salon & Spa heard just how badly I hated my grown-out haircut, they graciously invited me to give their services a spin, I jumped at the chance. It’s rough heading back into the salon after a long absence: Do you try to style that bird’s nest or just wander in with a nappy bun of shame? And, what happens if you hate the next haircut? To ease my deep-seated fear of the stylist’s chair, I made sure to prepare with ample pics of hairstyles I hoped we might be able to achieve and then patiently waited for the date of my appointment to arrive. I had a 4:15 pm appointment, and, from the second I walked in, was greeted with smiles—the receptionist, my stylist Michelle, even by name written in pretty cursive on a chalkboard all expressed a warm, and friendly greeting. Despite arriving slightly late, the receptionist made sure that I was offered tea or coffee and cookies for a nosh. Do you hate arriving at a salon, only to have to wait for your stylist to wrap up their previous appointment? Michelle, who turned out to be so sweet she’s likely made of sugar, was ready to go the moment got there, too. Which, after having to wait around at other salons—sometimes up to half an hour after your appointment time—the fact that everything was ready to go made this experience awesome right off the bat. Armed with photos, I sat down in Michelle’s chair and unwound my bun of shame while explaining that my hope was to continue growing it out, so hopefully she could shape up the layers. All that prep work? It turns out, was totally unnecessary. The full 20 years of Michelle’s experience was evident in just a few seconds. She explained where the current cut was making my face look wider, how longer layers in one area were creating a lack of volume and, best of all, her plan to fix it. It’d been that much fun. She managed to get rid of all my split ends and unevenness while creating the look of fuller, healthier hair without losing any visible length! Michelle had even created a top layer at my crown that could be bumped up for volume in the back, or swooshed to either side for a deep part depending on my style on any day. All-in-all, getting a cut at Hoshall’s was an exceptional. Do I still hate my hair? 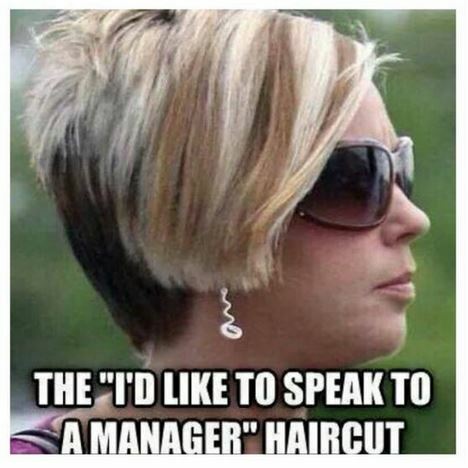 Just the opposite — this haircut is so fantastic, it’s turned into my favorite accessory. Bonus? The salon was clean and poshly decorated, the staff was friendly. And, as for Michelle, I absolutely loved my cut and couldn’t have asked for a better experience.